You are currently browsing the Dublin Event Guide weblog archives for April, 2018. Another outdoor event this week is Pets in the City and all the outdoor tours in Phoenix Park including the Magazine Fort have restarted after a VERY long winter break! And there is further good news on the bills. WE are nearly in May already, but not fully there yet and this month’s outstanding amount to pay the bill for May is down to EUR 150. We can do that!! :-) Thanks sooo much to all helpers! If you also want to support the Dublin Event Guide, I am suggesting a very fair EUR 12 for the year, that’s just 23 cent per Dublin Event Guide Edition or less than 3 pints for the whole year! That’s not much if you think about how much value the Dublin Event Guide brings you every week! ;-) Higher and lower donations are also appreciated! Every Euro counts! If you are a great and helpful person, you can help via PayPal here or if you don’t like PayPal too much and prefer to use your credit card go to GoFundMe here. THANK YOU!! And don’t forget that you can also help without spending a cent of your own money, if you buy through the advertisement links that are in the Dublin Event Guide or that are on the Dublin Event Guide Shopping Page at www.DublinEventGuide.com/shop If you want to buy from Groupon or LivingSocial or Amazon or Bookdepository or eBay or Asos or PrettyLittleThing or SportsDirect, just go to that website and click on the relevant link and it will bring you to the right place. The company you buy from will take 5-8% out of their profit (depending on the company) and will reward the Dublin Event Guide for promoting that company. But importantly you don’t pay more! Here are the links: www.dublineventguide.com/shop Thanks for using this page! The Dublin Event Guide needs your continued help in two areas: Your donations help paying the bills. Just 1 Euro per month (12 Euro per year) would be great, more would be even better. Not many subscribers are prepared (or able) to help, so please don’t rely on others! Your money will be used to pay the monthly EUR 240 bill for sending the newsletter using MailChimp, for web hosting and domain names. I am happy to work 35 hours on the Dublin Event Guide every week without making anything from it, but for the bills I need your help. You can make your donation at www.perfectresults.info/donate.htm using Paypal or CreditCard or send me a mail at dublineventguide@gmail.com if you prefer to pay by bank transfer. Corporate or enterprise sponsors are very welcome too and will get a bundle of benefits as a thank you for their donation, contact me on sponsorship@dublineventguide.com to discuss the details. And here is the second area where you can help: Without you spreading the word we would have never reached 24,000 subscribers and 74,000 Facebook Likes. Send your friends to www.dublineventguide.com where they can subscribe as well. Without putting your hand in your pocket at all you can help the Dublin Event Guide! Just use the ad links in the Dublin News Section and the banner ads in other sections as often as possible when you buy/order goods. If you buy goods immediately (in the same session) after clicking on a link/ad that you find in this publication (for example for Groupon, LivingSocial, Amazon, Book Depository, LastMinute etc), then you help the Dublin Event Guide everytime. This is how it works: The company you buy from will give a small commission (5-8%) to the Dublin Event Guide as a thanks for pointing you in their direction. This might only be 30 cent a go, but if many of you did it every time you buy something online, then it could make a big dent into the EUR 240 needed. Importantly, you do not pay more, but the merchant accepts a slightly smaller profit. So clicking on these ads is helping everybody! Thanks! We are more than 70,000 people on the Dublin Event Guide – Facebook Page at www.facebook.com/DublinEventGuide and are growing every week. Join in and click LIKE on the Facebook page and tell your friends! You will get last minute updates and event reminders through the Facebook Page and you can share your free events directly there with the other people in the Dublin Event Guide Community. The “Feel Good Slot” at this place in the Dublin Event Guide is to share some inspirational, motivational or thought provoking quotes, stories or video clips. You wonder why I added this section to this e-mail magazine? If your week was great, you might not need it, but most of us had some challenging moments in the last week and there could be more in the coming week and this section is for the people that want to overcome the hurdles, achieve more and remember that despite all, life is great! Most of us are focused on our senses, but they will not let us experience the beauty of life, let your heart feel a bit more and you will “see” more beauty! buy, you directly help the Dublin Event Guide. …IF you click on the link below! to get all she needs for aff ordable prices. Delivery is free on orders over EUR 30. To cover the cost for the Dublin Event Guide I need your help and every week generous and nice Dublin Event Guide readers help with a donation. Last week Roisin R, Mona R, Suzanne D, Tracey O’C, Jessica G and Barbara L were so wonderful to help with a donations. Thank you very much! You and all the other donors throughout the year are keeping the Dublin Event Guide alive! Without you, there would be no Dublin Event Guide!! The cost for sending the weekly newsletter is EUR 240 per month and a donation from you of just EUR 12 per year will ensure that I will be able to pay the bills. 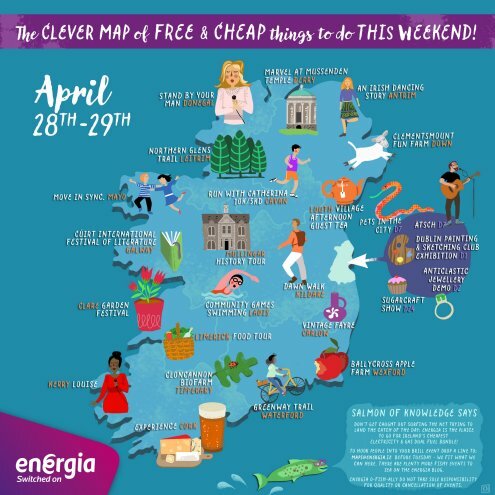 Has the Dublin Event Guide helped you to find events that you otherwise wouldn’t have known about, or have you saved money by finding great free events? Then please go to here and give something back if you can! I appreciate ANY help: EUR 12 would be great (that’s just 25 cent per week! ), but even if it is just the price of 2 pints it will help. You can donate online by following this link to the PayPal&CreditCard donation page. If you want to transfer your donation directly to my account, just send a mail to dublineventguide@gmail.com and I will send you the details. David S,Brendan R, Joan S, Stuart N, Filippo G, Gregory F, Mark C, Deirdre M, Howard L, Paul R, Linda McD, Isidro G, Gemma O’N, Aoife M, Anita W, Mark R, Clodagh O’C, Niamh D, Odhran K, Belinda B, Eimear L, Brian R, Andrew G, Marta T, Linda C, Grainne F, Rita B, Rosemary K, Mary McK, Ger O’B, Alison J, Sinead L, Lesley C, Noel N, Majella M, Mona O’R, Leigh P, Eric C, Anette K D, Aoife G, Aidan C, George K, Rita B, Thomas G, Roy C, Jutta B-S, Lorna O’C, Aisling McK, Miriam L, Fergus O’T, Julia Sch, Helen B, Susan H, Paula R, Justin M, Tony B, Ross M, Daniel L, Susan F, Joan S, Rachel McG, John F, Ann Marie S, Melanie B, Magdalena H, Leigh Ph, Mark G, Joanne M, Louise F, Kathryn H, Ornaigh G, Eamonn U, Gerard Ph, Fiona F, Gabriel K, Laura C, Aislinn T, Barry M, Joan S, Nicole W, Tara R, Denise G, Ann M, Mairin M, Daire O’C, Anne H, Anne H, Comet Records, John F, Nora O’K, David O’K, Karen+Brian F, Estelle K, Ann McP, Noelle H, Pat M, Meav Ni M, Jutta B-S, Jamie C, Leigh Ph, Irene D M, Michael D, Joan S, Melanie B, Anita W, Maria F, Moira dF, Arthur D, Catherine G, Clodagh C, Elaine K, Majella M, Ann M, Clodagh O’C, Claire R, Leigh Ph, Sarah L, Mark G, Erzsebet H, Isidro G, Karen A, Sean S, Melanie M, Zelie McG, Lindsay R, Thibaut D, Pia O, James B, Marguerite D, Shai C, Susan K, Agnieszka S-S, Alice K, Ieva B, Ruth L, Ana RT, Rita B, Sueanne O’H, Rosemary M, Darragh D, Lorraine S, Helena S, Carija I, Pat McK, Jennifer R, Sophie P-L, Jenny B, Catherine F, Stephen S, Juliana A Y, Caoimhe NiM, Damien B, Shane O’B, Melanie S, Audrey H, Catherine E, Michele McN, Susan B, Sharon K, Bill G, Malachy B, Catherine O’S, Paula R, Pamela A, Eleonora P, Thomas B, Karen K, Brendan M, Eric O’F, Gale G, Daniel LG, Mark G, Margo C, Joan S, Debbie C, Karen McG, Eric C, Irish Family Names, Tom McM, Aishling B, Ana RT, Eamonn McG, Silja P, Nicola R, Jacinta O’B, Siobhan B, Orla P, Sharon G, Isidro G, Carmel C, Roisin R, Mona R, Suzanne D, Tracey O’C, Jessica G, Barbara L and Travel Agency “Project Travel” (www.project-travel.ie Ireland’s only Norway and Northern Lights Travel Experts), Arthur’s Pub (www.arthurspub.ie A classic Dublin old-style pub in 28 Thomas Street with a new and buzzing music venue that runs lots of events), the Speedfriending Ireland Meet-up Group (www.meetup.com/Events-Drinks-Talks-Dublin/) (Where you can meet lots of new people and make friends), Cycling Campaign (www.dublincycling.ie), www.oliviercornetgallery.com (An Art Gallery in 5 Cavendish Row), www.thepaulkanegallery.com (A great Art Gallery, on the search for a new venue), www.cfcp.ie (The Centre for Creative Practices is the the only arts centre in Ireland dedicated to connecting, integrating and promoting immigrant, experimental and emerging artists among the local arts scene and audiences). The main sponsor is Energia and their support is hugely appreciated! Energia provides cost efficient electricity and gas to Irish homes and businesses. The company is committed to developing renewable energy sources in Ireland and over 25% of the country’s wind power is supplied through Energia. Energia‘s power plants in North Dublin are capable of providing enough energy to power 1.2 million homes. All events listed in this Event Guide are free of any admission charges (or at least appear to be free) unless otherwise stated. I try to find confirmation in all cases and do my best to double-check the information. However errors can happen and therefore no guarantee for correctness can be given. This section is intended to provide some help in picking and choosing from the huge number of events by sharing with you what I will/might or would do. This is not a “best of…” list and if an event is not listed here, it by no means implies that the event is not interesting. Instead my “picks” are just based on my personal preferences. All events mentioned here are described in detail further down. There is a Flea for Choice on Saturday and then the normal monthly Dublin Flea Market on Sunday. Pets in the City is for all the animal lovers tomorrow and during the week on 01 May the Bealtaine Festival will start and run (with lots of events) throughout May. Postage to Ireland is free for most orders if you buy for more than GBP 25! And with every order via this link, the Dublin Event Guide (for Free Events) gets a small commission: HERE It doesn’t cost you anything more, but you help the Dublin Event Guide. Use the link as often as possible! More competitions to come soon! Help the Dublin Event Guide! It won’t cost you a cent! Do you enjoy free events? Does it help you to find out about all these free events simply in one e-mail magazine or on one website? Does the Dublin Event Guide (for Free Events) deliver all this for you and maybe even more? In that case, you probably also would want it to continue forever, right? To achieve that some money is needed. Donations are a great help, but not everyone feels they can donate at the moment. So here is the solution: If you could help with a donation without having to pay a cent from your own money wouldn’t that be cool? You can!! When you click on the link and then buy, your books/products/holidays etc cost exactly the same as if you went to the website directly. But if you go via the links above, the Dublin Event Guide (for Free Events) will get 5-8% of what you spend as a commission. That’s not a lot, but if you and lots of other people used that link every time, it would amount to a fair amount of crucially important money. Use the links often, actually EVERY time you buy from the relevant site, not just once! Giving money for free! That’s how easy it is. ;-) THANK YOU!!! The Dublin: One City, One Book Festival is coming to an end at the end of April and the Bealtaine Festival that celebrates “art and creativity as we age” is taking over. There is a huge amount of Bealtaine Events, but the exact target group is a bit wishy washy. Have look at my Bealtaine assessment, you find it in the event listings on Tuesday 01 May at 09:00. Smyth Toys have announced that they will buy the Toys ‘R’ Us shops in Germany, Austria and Switzerland. Since Toys ‘R’ Us is insolvent and would not manage to get out of bankruptcy EVEN if they kept the profitable locations in Europe and got rid of the US and UK operations, they decided now to sell everything. Smyths will buy 93 shop sand four online stores and they will add this to their existing 110 shops. On top of that I will every now and then include here a small selection of exhibitions that either are not mentioned in the Visual Artist listing or are note-worthy to be mentioned separately. “Ireland’s Great Hunger Museum” at Quinnipiac University in Hamden, Connecticut, is sending its art collection to Ireland for the first time. The exhibition documents the scale of the famine, the horror of it, how it permeated and changed Ireland and the people that escaped it forever. The museum’s collection, the only one of its kind in the world, constitutes an incomparable direct link to the past of almost 6.5 million Irish and 40 million Irish-American people. The Dublin Painting and Sketching Club is inviting to their 140th yearly exhibition in the CHQ in the IFSC. 170 paintings from the clubs more than 70 members will be on show. Hi! Fashion is an exhibition of garments from the collections of Issey Miyake, John Rocha, Noritaka Tatehana and Úna Burke. Hi! Fashion presents womenswear garments and accessories, which explore visual correlations and contrasts between Japan and Ireland over the last 60 years. A weekly car boot sale, one of less than a handful that is still reliably taking place, has up to 200 cars/sellers. The stadium is just a few minutes walk from the Red LUAS line stop and numerous bus stops. For traders the Car Boot Sale opens at 06:30 for buyers from 08:00. If you are interested in selling, check the details and register on their website. “Dublin: One City, One Book” is an initiative by Dublin City Council that encourages everyone to read a book connected with the capital city during the month of April every year. The One City, One Book choice for 2018 is “The Long Gaze Back” edited by Sinéad Gleeson has the subtitle “An Anthology of Irish Women Writers”. The book is a collection of thirty stories from writers from the 18th Century to now. Throughout April there will be numerous events in connection with this literature event. The website is below and if you want to download the programme, you can do that here. A good number of events are free, but often booking is required and the tickets will go faster than you think, so don’t delay. The weekly Honest2goodness food market in Glasnevin has fresh meat, vegetables, fish, baked goods, and wines. It is open from 09:30-16:00. It is behind Lidl in the Industrial Estate just after the Glasnevin Cemetary coming from the City Centre. Parkrun Ireland is organising free weekly runs in parks. It is a timed run over 5km and participation is completely free, but registration before your first parkrun is required. The SuperNatural Food Market is taking place every Saturday from 09:30-15:30 in St. Andrews Resource Centre in Pearse Street, Dublin 2. The Green Door Market is a new indoor food/Farmer’s Market that takes place just a few doors down from the Dublin Food Co-op at Newmarket in Dublin 8. Admission is free. Opening hours are Thu-Fri 12:00-19:00 and Sat 09:30-16:00. The Belgard Weekend Market is an indoor market with stalls with handcraft (incl. designer jewellery, aran jumpers and wool, christening robes and shawls, cards and cross stitch), household items, bric and brac, furniture, flowers, make-up, clothes, shoes, showers, upholstery, toys, kitchens, cafe, army memorabilia, collectors items, sweets, handbags books, blinds, party shop, tools and more. It is open every Saturday and Sunday and is located in the Glen Abbey complex (opposite Jacobs) on Belgard Road. Jamestown Flea Market + Car Boot Sale takes place every Sat+Sun from 10:00-17:00. You can reach it from Tyrconnell Road and from Kylemore Road and it is within 3 min from Black Horse stop on the red Luas line. There is free parking. A Jobs Expo will take place in the Hogan Suite of the Croke Park Conference Centre. There will be lots of employers present, Seminars will help you with job/application related questions and Career Coaches are available. The County Council Market (CoCo) in Marlay Park is taking place every Saturday and Sunday. You will find a wide range of products. There will be food to eat there and food to cook at home but also crafts and arts and books and lots more. The Temple Bar Markets (Food Market on Meeting House Square, Book Market on Temple Bar Square and the Designer Mart near Cow’s Lane) are taking place every Saturday from 10:00-16:30. Dublin City Hall has a museum/exhibition in the basement, called “The Story of the Capital”, it is an exhibition that you should definitely check out at some stage. To celebrate the Easter Rising Anniversary, admission to that exhibititon was free in 2016, but lucky for us, Dublin City decided to also waive the admission charge for 2018. Opening hours are Monday-Saturday 10:00-17:15. Áras an Uachtaráin is the residence of the President of Ireland in the middle of Phoenix Park. It started as a modest brick house for the Phoenix Park Chief Ranger in 1751, was then turned into th ‘occasional residence’ for the Lords-Lieutenant and gradually evolved into a huge mansion. After Ireland gained independence it was turned after 1937 into the residence of the Irish president. Every Saturday a number of public tours take place and admission is free. Tickets will be issued at the Phoenix Park Visitor Centre on the day, on a first come, first served basis. Group and/or advance booking is not possible. The tours will be at 10:15, 11:30, 12:45, 14:00 and 15:15 and take approx. 1 hour. The Drumcondra Village Market is now the “Art, Bites, Crafts Drumcondra Market”. And as you guessed it, it is an arts and crafts fair in the centre of Drumcondra. :-) There will also be some food and music. The market is open on Saturday and Sunday from 10:30-15:30. At the Blackrock Market in the centre of Blackrock, you’ll find 50 stalls selling collectibles, antiques, handmade goods, books, food & there’s free popcorn, ballons & facepainting for the kids. Open on Saturdays and Bank Holidays: 11:00-17:30, and Sundays: 12:00-17:30. The Terenure Bushy Park Market is taking place every weekk. The market has more than 30 stalls, offering a whole variety of foods and crafts. The National Gallery has an extensive programme of free talks, public tours and Art Documentary screenings every day of the week. Currently there is at least one free tour every day. Check their website for details. Some special events will be listed separately. Admission to the gallery and to most events is free. The current exhibition in the Science Gallery is called “FAKE” and it will run from 08 March until 03 June. The exhibition is looking at everything Fake from fake meat and fake cheese to fake emotions. In both the natural world and human society, faking, mimicking and copying can be a reliable strategy for success, a fake may be just as valuable as the real thing. But what about replicating taste, emotions, chemical signatures, facts and trademarks? When is authenticity essential and when is copying cool? + synthHAsizer will let you record your own fake laugh and use sonic filters to remix it from fake to real. + Mississippi Swan: Daybew! will create fake music: A new album of songs every fifteen minutes or around 700 unique songs every day. You can trigger the creation of a unique album at any time. + There is even a deli where you can buy fake food samples for EUR 2. For example they have fake cheese, fake meat or “Dubliner Red Cheddar” cheese that is neither manufactured in Dublin nor is it Red Cheddar, it is coloured white cheddar manufactured in Cork. The website below lists all exhibits and provides some explanation so that you can either before or after your visit check further details. All Science Gallery exhibitions are suitable for ALL ages, even younger children will be able to take part/follow. Some of the exhibits need a bit more of an age-appropriate explanation for younger kids than others, but nearly everything can be simplified for kids. I strongly suggest to use the help of the amazing mediators, who can explain everything you see, especially if you don’t want to read all the explanations that are next to every exhibit. The Science Gallery has very visitor friendly opening hours of Tue-Fri 12:00-20:00 and Sat+Sun 12:00-18:00. The Fashion Revolution Market is an extension or add-on to the Hapenny Market this week. It will take place in the Loft area upstairs in the Grand Social and you will find Vintage, Preloved, Upcycled and Ethical fashion. This is a Flea Market in the Workman’s Club where all stall fees will go to the organisation “Together for Yes”. Please note: There is a suggested donation of EUR 1 per person at the door. The weekly Ha’penny Flea Market is an indoor market in the Grand Social Pub, which offers vintage Men and Women’s clothing, contemporary crafts, books, DVDs, vinyl records, vintage and handmade jewellery, vintage hair styles, art, photography and much more. Grand Social’s Bar and Gourmet Coffee options are available. This is a Fashion Upcycle event during Fashion Revolution Ireland Week and all details are on the website below. The event is booked out, but often at free events there are no-shows, so there is a small chance that you can still get in if you ask nicely on the day. Archive at Lunchtime screenings take place Saturdays (Double Bill), Mondays and Wednesdays. The programme is changing weekly now (instead of monthly as in the past). To find out what film(s) will be screened go to www.ifi.ie/whatson/now-showing-coming-soon/ and look for “Archive at Lunchtime” on the right. Admission is free. “The Life and Work of Margaret Stokes – Antiquarian and Artist” is a tour in the National Museum in Kildare Street. Margaret McNair Stokes was one of the leading female Irish antiquarians of the 19th century. She wrote extensively on the Early Christian art of Ireland, examining some of the iconic objects now housed in the National Museum of Ireland Archaeology (e.g. the Ardagh Chalice, ‘Tara’ Brooch and Cross of Cong). At this tour with Annie Birney, you will explore the life and work of Margaret Stokes through the objects she studied and drew. Admission is free, but booking is required via educationarch@museum.ie or 01 6486 334. Meet at Reception. Suitable for adults. An Open Day is taking place at the Nutgrove Fire Station with entertainment for the whole family, Face Painters, Balloon Modelling, cool Firetrucks to admire, cool Firemen to talk to ;-) and refreshments for super low prices. All proceeds will go to the organisation “Suicide or Survive”. A free anticlastic jewellery demonstration from gold and silversmith Jason MacGabhann of Casúr Óir (www.casuroirjewellery.com) will take place. Watch Jason make a piece of jewellery from start to finish with just a few tools and years of experience. This demonstration is part of the “A Little Nonsense Now & Then is Relished by the Wisest Men” Jewellery exhibition in the Fumbally Exchange (21-29 April). The website below is the Eventbrite site, but I am not sure if registration is required and it doesn’t seem like it is. And if you have never heard the term “anticlastic”, here is what it means: “having opposite curvatures at a given point. Specifically: curved convexly along a longitudinal plane section and concavely along the perpendicular section”. Every Saturday a free guided tour will take place in the Chester Betty Library. The tour starts at 14:00. This is an Intercultural Tour in Arabic Language with Community Ambassador Bayan Musallam. Admission is free and meeting point is in the atrium of the Library. The Stillorgan Orchard has live music every Friday and Saturday. Many of the performers are established and very good bands. The upcoming gigs are detailed on the website below. Admission is always free. The Howlin Hawks, a 4 piece Blues/ Soul/Jazz cover band will play a gig in Bray. Zombie Picnic is a four-piece, prog/post-rock instrumental band from Limerick and they will play a gig in Sin E. Support band will be “The Dead Sets”. Admission seems to be free. Crowhammer call themselves “Dublin’s premier narrative driven sci-fi/fantasy stonerrock/krautrock music group”, whatever that is. :-O They will play a gig in Whelan’s on Saturday. Support group will be “The Disco Participation Matrix”. Admission is free before 22:30. At the Slipped Disk Indie Disco on Saturday in The Underground at Peadar Kearney’s you will hear and can dance to upbeat classics from the likes of The Jam, Clash, Specials, Undertones, Stranglers, Joy Division, Blondie, Cranberries, Elvis Costello, Depeche Mode and the B52s. The 70s, 80s and 90s will be covered. The Deck Doc will be your DJ for the night. Supafreak will play a Funk / Soul / Disco gig on Saturday. Rock Tribunal will play a gig in the Porterhouse in Temple Bar. In addition to the Saturday Car Boot Sale in Tallaght, Irish Car Boot Sales run a weekly Sunday Car Boot Sales in Ballymun. Admission for buyers is free. The Magazine Fort in Phoenix Park was for a long time completely neglected, but it is hugely rich in history. Many have seen it as a barred off concrete fortress in a corner of Phoenix Park and even more don’t even know or have forgotten that it exists. The old Phoenix House, the home of the British Viceroy, was on the site where the fort was built from the early 17th century and then in 1734 the Fort was built and extended in 1801. In 1916 the Fort was raided by the rebels who expected to find a lot of explosives there, but found the Fort nearly empty. In 1939 the IRA raided the Fort and stole more than a million rounds of ammunition, but most of it was recovered over the following weeks. Since 1988, the Irish Army doesn’t use the Fort anymore and gave it back to the Office of Public Works (OPW), but not much good has happened to the Fort in the last 30 years (!!) and there were numerous speculations about the reasons for that. Finally since 2016, guided tours are provided and this year from April until end of October there will be three tours every Sunday at 10:00, 12:00 and 14:00. Only 20 places are available on each tour and if there is a big event in Phoenix Park the tour will be cancelled. Tickets are available at the Phoenix Park Visitor Centre on a first come, first served basis and can not be pre-booked. A shuttle bus will bring the ticket holders to the Fort. Every Sunday, the Merrion Square Open Air Art Gallery takes place. Up to 200 artists exhibit their paintings on the railings on three sides (West, North and East) of Merrion Square and you can just enjoy the exhibition or even buy. The National Botanic Gardens run “Kids Drop by Activities” on Sunday of this week. There will be fun activities in the dedicated Children’s Garden. Sow seeds, make seed bombs, design bug hotels and re-use everyday items to create your own piece of eco art. Suitable from age 4. All children must bring their own grown up. A weekly market with lots of food, but also many other products (art & crafts, books, etc) takes place every Sunday in the beautiful People’s Park in Dun Laoghaire. It is a very popular market and with around 50 vendors also one of the bigger markets. “Forgotten Voices” is a 2-hour walking tour that will explore the lives of the people who lived in Dublin’s inner city from the Georgian Period to the middle of the last century. Meeting point is at the entrance of the Four Courts Dublin. The tour is free but donations are welcome and booking is required via email to forgottenvoiceswalkingtour@gmail.com or – if you can’t book beforehand – just show up on the day. Private group bookings off up to 25 people can be accommodated at a different time and or day on request. The Kilkenny Shop Cafe is inviting to a Jazz Brunch Sunday every Sunday from 11:00-14:00 and from 14:30-16:30 a Bluegrass Band is taking over. Unfortuantely they don’t specify who the bands are. The well known Palestrina Choir sing every Sunday at the mass in St Mary’s Pro-Cathedral. They sing complete masterworks by Mozart, Haydn, Dvorak, Palestrina, de Victoria, usually accompanied by Prof. Gerard Gillen on the organ, who often also plays a solo piece. The tour “Art in Literature” will explore artworks with literary connections. This tour is part of a series of events organised to celebrate the Dublin: One City One Book festival. Admission is free. Meet at the Merrion Square information desk. This is a Drop-in family session, a free art-making workshop where children and their parents/guardians/carers are encouraged to work together on creative projects. Drop-in and stay for as long (or as little!) as you wish! The workshops are suitable for children of all ages. Admission is free and no booking is required. The schedule of events can be found here. Admission is free and the event is suitable for the whole family including your pets! Open on Sundays: 12:00-17:30. Open on Saturdays and Bank Holidays: 11:00-17:30. A Family Fun Day will take place in the National Print Museum. Children can become a mini printer for the day and there will be printing demonstrations, face painting, mini children’s workshops and self-guided arts and crafts activities in the Education Area. Every Sunday, the National Botanic Gardens invite to two guided walks. The first one is at 12:00 and the second one at 14:30. The Sundays at Noon Concert Series continues in the Sculpture Gallery at the Hugh Lane Gallery. This series of free (mainly classical) concerts continues to present the best of Irish and International music and musicians. Concerts run from September to June. This Family Tour is specially designed for children and their guardians, parents and carers to make the works on display in the National Gallery fun and engaging for kids. Low priced books with free delivery! Buy your books from The Book Depository and get better prices and free (!!) delivery for all orders independent from the volume and when you click on the picture here before you buy, then 5% of what normally The Book Depository would get, they give back to the Dublin Event Guide. Everybody wins! If you prefer Amazon to buy your books (for free postage you need to order a minimum of GBP 25), then use this Amazon link to help the Dublin Event Guide. Thanks! The “Dublin Sketchers” is an informal group of (hobby) artists who go somewhere different in Dublin every Sunday (e.g. National Museum, Maritime Museum, Dublin Flea Market, Farmleigh, Botanic Gardens, Dublin Castle, Science Gallery, …), sketch for one to two hours and then meet up for coffee afterwards and discuss their sketches. There are some hugely talented people among them and it is a great idea to meet up with others who have the same hobby. Find out on their website below or on their Facebook Page where they will meet and join them if you do some sketching/drawing yourself. I know that the Dublin Sketchers often use the Dublin Event Guide to find interesting free events and I am delighted to be able to help! As part of the public programme for the exhibition “Emil Nolde: Colour is Life”, the GUM Collective, a group of Dublin based visual artists, is engaging with and respond to the exhibition. They will be based in the Millennium Wing Studio and will investigate the life and work of Emil Nolde through their individual art practices and via an evolving programme of education and public engagement activities. On Sunday they will run an Open Studio event. You are invited in to take a look around their work space in the Millennium Wing Studio and to chat to the artists about their work. Every Sunday a free tour takes place in the Hugh Lane Gallery. Admission is free and booking is not required, but places are limited, so early arrival is recommended. Every Sunday a free guided tour will take place in the Chester Betty Library. The tour starts at 15:00. Unlike the three branches of the National Museum, the National Print Museum is normally not free, but every Sunday there is a free public tour for the next few weeks. Every visit begins with a short audio-visual presentation where the audience can observe active retired printers providing practical demonstrations of machines from the Museum’s collection. This is a monthly lecture about pollinators and a walk recording the many different species of pollinators fund within the Park. This is a tour of “Recovered Voices”, exploring the experience of Irish men and women during World War I. Admission is free and the event is suitable for adults and children from 12+. places will be allocated on a first-come basis 15 minutes before tour starts. Sunday Sketching for the whole family takes place every Sunday in the Hugh Lane Gallery and admission is free. Families are invited to explore and respond together the gallery’s collection and temporary exhibitions through discussion and drawing. Bring your own sketchbook along or use the drawing materials provided. Admission is free and no booking required, although numbers may be limited. Suited for ages 6+. Travel around European traditional dancing culture without a ticket at the weekly Bal Folk Dance Sessions. And if you don’t know how to dance, don’t worry! Workshops are provided and admission is free. Donations are appreciated. The event takes place every Sunday in the Cobblestone Pub. Blues Got Soul, a four-piece blues band from Dublin is performing the music of the founding fathers of blues and blues masters in the International Bar every Sunday. Admission is free, but donations are welcome. The High Leeson is a Bluegrass band that plays every Sunday in the Leeson Longe. The Dixeland Jazzmen play a weekly gig in Sin E. Admission is free. At the Jawbone Gig night in Arthur’s Pub, Acoustic Folk & Blues will be performed every Sunday. Admission is free. The Gardiner Street Gospel Choir sings every Sunday from September to June at their “Gig in God’s Gaff”, a Mass in St. Francis Xavier Church at the top of Gardiner Street near the junction with Dorset Street. The Gardiner Street Gospel Choir, one of the best known gospel choirs in Ireland will give you a chance to experience a mass with a difference. It is uplifting and inspiring and everybody is welcome independent from your level of religiousness or your relationship with the Catholic Church in other contexts. Pete Cummins, Grammy award winning songwriter will play a gig in the Leeson Lounge. The Comedy Crunch is a free Stand Up comedy downstairs in Stag’s Head, Dame Lane from 21:00 every week on Sunday, Monday and Tuesday. Every week different comedians entertain and on top of that there is some free ice cream. The line-up can be found via the Comedy Crunch Facebook Page (see link below). Jared Dylan from New Jersey, USA will be in the Harbour Bar for gig. His styles are Pop & Alternative. The Dublin Blues Cartel will be in Whelan’s again and will perform mostly a version of New Orleans R’n’B with a classic Rock twist, sandwiched with Swing, Rock’n’Roll, Soul, Funk, Blues and Rap of all eras. Monday at the Cinema is a series of screenings dedicated to Italian contemporary cinema. The next film is the documentary “Terra di Transito” (2014, 52 min). The screening will be in Italian with English subtitles. “Letters of Distinction: Somerville and Ross” is a talk with Martina Devlin (novelist and journalist) and she discusses the fascinating letters from The Irish RM and The Long Gaze Back authors Somerville and Ross, to their literary agent in the early 1900s. “The 1918 Conscription Crisis” is a talk by Cormac Moore (Historian in Residence with Dublin City Council). The talk marks the 100th Anniversary of the Conscription Crisis which saw nationalist Ireland vigorously oppose the British Government’s plan to introduce conscription to Ireland. The next lecture at the irish Astronomical Society will be about “Archaeoastronomy” by Dr Frank Prendergast. Song Cycle is a weekly Singer/Songriter showcase in Wheelan’s. The Circle Sessions is an “Open Mic” that provides an opportunity for up and coming musicians, spoken word artists, poets and comedians to perform. Come to this weekly show to perform or to simply watch a great mix of music, poetry, spoken word and comedy. Every Monday a Jazz Jam Session will take place in the Grand Social and you are invited to listen or even to participate. Admission is free for musicians and audience. Instruments are supplied (drums (no cymbals), double bass, guitar amp, bass amp, PA system) and ideas and themes will be proposed prior to the session to the musicians who join the event on Facebook (see Facebook Page below). Every Monday the Woolshed Bar hosts “The Comedy Shed”, usually with 3 headline acts. The Comedy Crunch is a free Stand Up comedy event every Sunday, Monday and Tuesday. Every week different comedians entertain and on top of good comedy you will get free ice cream. Admission is free. The line-up can be found via the Comedy Crunch Facebook Page (see link below). Guitarist Jimmy Smyth will play a regular gig on Mondays in the Leeson Lounge with band Organised and occasional guests. An Open Trad Music Session is taking place every Monday in Mother Reilly’s. Admission is free. The band “10,000 Hours” is playing a gig in Porterhouse Temple Bar. That’s It Recordings is an open mic every Monday at Sin E. Just turn up and play. Sign up before 22:00 to ensure you get a slot. Bring a USB stick along and you will get a recording of your music to take home. NOT the first day of Summer!!! It is an extremely stubborn myth in Ireland that Summer starts on 01 May. Primary teachers were and are still (!!) teaching it, despite Met Eireann’s repeated attempts to correct this misinformation. It is true that the Celts started their “summer” on 01 May, but they lived by a completely different calendar: For the Celts the Dark half of the year started on 01 November and the light half started on 01 May. So strictly speaking it wasn’t even their start of summer, it was just the start of the light half of the year. In addition their day started at sunset! If, however, you have adjusted to a modern calendar – unlike your primary teacher!? – then the start of summer is on 01 June as Met Eireann confirms to us. And if you use a thermometer to determine the seasons then you KNOW anyway that this weather outside just CAN’T be summer! So have a great May Day and look forward to the start of summer in 31 days. The Alliance Française Dublin’s Comic Book Festival is taking place from Tuesday 01 May until Saturday 05 May. There will be readings, signings, screening, exhibition, a book fair, round table interviews and workshops and 86 year old well-known French illustrator Tomi Ungerer will also be in Dublin for this event. Here are some of the events, a fulll list and detailed descriptions of all events are available on the website below and you can book there as well. Every May the Bealtaine Festival takes place all over Ireland and it “Celebrates arts and creativity as we age”. So where does that leave us? We don’t know really know!! So I guess if you feel older, this festival is for you and if you don’t, then the festival is not for you. ;-) I hope that explanation helps a little. There will be many events throughout May and a good few of them are free. The website has a good enough search facility, although I never understand why event organisers subdivide Dublin into four or five “territories”. You can also download the brochure via this page (look for the Download link at the bottom – it is currently disabled, but I will try to get them to enable it next week). In “Dublin City” there are approx. 72 events, but as I said, not all are free. Oddly, the events are sorted in reverse order, starting with the 30 May. Talk about confusing “older” users!? The PhotoIreland Festival will run from 01-31 May. It is a month full of contemporary photo exhibitions, book launches etc. All details are in the website below and there is also a downloadable Catalogue available and all the online resources you need. Admission to all events is free – as far as I can see. “Conversations on Art: Dementia-friendly tour” is an interactive tour specially designed for people living with dementia and their loved ones. Admission is free, but booking is required via Heidi Campbell on 01 4070766. The pop-up talk “A Vanitas Fruit-piece” in Room 39 with Valerie Moffatt will be about Jan Davidsz de Heem’s painting “A Vanitas Fruit-piece”. The theme of this “Quantified Self Meet Up” is “Quantified Wellness & Assisted Living”. Do you track personal information, hoping to gain insights into yourself or your surrounding world? The Dublin Quantified Self group (#QSelfDublin) is for anyone interested in self-tracking. Admission is free, but booking is require via the website below, where you will also find the list of speakers. The Irish Wildlife Trust (IWT) continues to bring you Dublin Green Drinks on the first Tuesday of every month in J.W. Sweetman’s. Green Drinks is a monthly event in 711 cities around the world to bring people with an interest in green issues together. Declan Murphy will talk about one of Ireland’s newest arrivals, the Greater Spotted Woodpecker. Meet up on the top floor of J.W. Sweetman’s. Doors open at 18:30 and the talk is at 19:00. Admission is free. EveryTuesday at 19:00, The Dublin Language Exchange takes place in the Czech Inn. It is the biggest free meeting of people from all around Dublin that are interested in learning languages and communicate with speakers of other languages. Admission is free and the meetup is completely informal. No booking required. Ben Prevo will play a solo acoustic gig on Tuesday. Expect Blues, Folk & Country, Originals, Covers and Jams. Rumours have it that the Bluegrass Collective will perform in Sin É on Tuesday and there might even be an open Bluegrass Jam! Admission is free. Jesters is a weekly open mic comedy event where a lot of comedians do 5 minutes of material. Admission is free. If you would like to perform then send a message to the Jesters Facebook Page via the link below. Every Tuesday an informal sing along with Ukulele and Toy Musical Instruments takes place in the Stag’s Head. Just bring your instrument and come along. Beginners are welcome. Admission is free and further details (and a big book of songs) are available on the Facebook Page below. The Lounge Quintet plays this gig every Tuesday: Jazz Standards, Latin and Bebop. Often guest musicians and singers join them. Admission is free, donations are welcome. Every Tuesday and Thursday the International Bar invites to a Jazz night in the Lounge. Groups led by Cote Calmet, Sean Maynard Smith, Dominic Mullan, Paddy Groenland, Georgia Cusack & Alex Mathias are performing regularly with occasional guest players, but there are also other bands from all over. Admission is free, with a suggested donation of EUR 5. The website clearly says that there is no entry fee, but – and that makes a lot of sense – that your donations are very much appreciated (Musicians need to pay for rent and food too!) Be generous after the gig if you liked it, but if someone wants to charge an admission charge, please point out that the “rules” as described on their website are like I have explained. Every Tuesday, a pub quiz is taking place in the Woolshed. Admission is free. Max team size is 6 people. For years, this event was one of the most popular monthly events with a HUGE amount of people taking part. But since Kevin Moran became the Junior Minister in charge of the OPW last year, it got more or less terminated for all of us in Dublin. The Free Wednesday (currently) still continues in some locations outside of Dublin, but the interesting heritage sites in Dublin have been removed from the list. “Free Wednesday” is the first Wednesday every month when entry charges at some state-owned heritage sites are waived. The sites are all owned by the state and managed by the Office of Public Works (OPW). Many OPW managed sites can already be visited for free (e.g. Farmleigh House, Phoenix Park, National Botanic Gardens, Pearse Museum, etc), but some sites that normally charge a fee will be free every first Wednesday as well. Regrettably Kilmainham Gaol and Dublin Castle were removed from this great initiative and The Casino in Marino is still closed for an indefinite period of time, so the only site in Dublin that is still taking part (for another bit!?) is Rathfarnham Castle. More recently the Brú na Bóinne Visitor Centre at Newgrange also has been removed from the list and therefore I will include this event this month for the last time. Outside but near to Dublin, you can still visit the Glendalough Visitor Centre in Wicklow free of charge on Wednesday, but that’s not much. The full list of sites in Ireland is here. The Rediscovery Centre is a new eco destination for Dublin. It is based in the old Boiler House in Ballymun and hosts courses in Furniture Upcycling, Fashion Upcycling, Childrens Workshops and Bike Maintenance Workshops. On the first Wednesday of each month, they invite to a information tour of the revamped Boiler House. Did you ever want to give drawing a go? Or maybe you are a budding artist looking for like-minded people to draw with? The Drawing Group for Adults in Rua Red runs free weekly drawing sessions on Wednesdays from 11:00-12:00. Materials are provided. The theme of this week’s Wednesday Walk in Phoenix Park is the “Phoenix Park Murders”. It is a walk to the location of the 1882 Phoenix Park Murders, featuring the history of this tragic event. Fuss on the Bus is a musical play that will be performed three times in May. The first performance will be in Rathmines Library. Admission is free, but booking is required via 01-4973539. The play by Carnation Theatre tells the story of life by way of a bus journey. Nell and her best friend, Rita take the 33 bus each year to Balbriggan. A whole life will be lived and loved from school days to free travel. An invitation to remember shops, pubs, characters and local history along the journey. Comedy, drama, music, soundscapes, colourful costumes and sets. A free guided tour will take place at the National War Memorial at Islandbridge every Wednesday at 14:00 from March until the end of October. The tour will focus on World War I, in which nearly 50,000 Irish soldiers died. You will also hear about the main features of the gardens at this tour. Meeting point is the car park at 14:00 (next to the Trinity College Boat Club). For further information and to check that it is taking place, contact 01-6770095 (Phoenix Park Visitor Centre). The Philosophy Department at Trinity College Dublin is screening a documentary film about the Nuremberg Trials. The International Military Tribunal at Nuremberg (1945-1946) established the ‘Nuremberg Principles’ – the foundation of all subsequent trials for crimes against peace, war crimes, genocide and crimes against humanity. It led to the formation of the International Criminal Court in The Hague. The film “Nuremberg: Its Lessons for Today” was shown in Germany in 1948-1949 as part of the denazification programme but US officials prevented its subsequent release to American theatres for political reasons. This is an evening discussing the Moon as a myth and a symbol, with readings from different cultures, involving a number of contributors organised by Roberto Bertoni (Trinity College Dublin, Department of Italian). Admission is free but booking is required (see website) and the full programme is on the website below. In a series of history talks about 1918 the first talk is “Food Rationing and the Spanish Influenza” in Coolock Library. Dublin City Council’s Historians in Residence, Cathy Scuffil and Donal Fallon will give this talk. Admission is free, but booking is required via 01-8477781. A talk about wrtiers Calvino, Sciascia and Giufà by Prof. Joseph Francese (in English) will take place. Admissionis free, but registration is required via the website below where you will also find more details about the talk. The Dwarf Jar House Trio (Daniel Rorke (sax), Cormac O’Brien (bass) and Matthew Jacobson(drums)) will play a weekly Jazz gig every Wednesday in Dwarf Jar Cafe and they usually have one or more guest musicians or singers supporting them. The Roots Band “Brand New Switcharoo” will perform in the Harbour Bar. Admission is free. The Dublin Jam Session is an open Jam with full back line. It is open to all levels of musicians and singers and all genres of music and the only rule is that you must jam with others (not all your own band). It takes place every Wednesday and admission is free. The Wow Wignal Sessions is a weekly gig night in Bagots Hutton. The line up is usually announced just a few days before on the Facebook Page below. The Anseo Comedy Club takes place every Wednesday in Anseo (upstairs). “The Zodiac Sessions” is a regular open mic event from 20:30 in Bruxelles (between Grafton Street and Westbury Hotel) for unsigned musicians. Admission is free and there is a different line-up every week. Dance Forro every week at this “Forro Wednesday” in the Woolshed for free. Los Paradiso are playing Rockabilly, Tex Mex, Western Swing, Surf in the Leeson Lounge. Admission is free, but donations are appreciated. Candlelit Storytelling will come to the Harbour Bar in Bray with their new storytelling programme “Mighty Mythic Mammies”. Irish mythology is full of stories about Irish mothers and at this event you will hear the best of them. “Shipwrecked” is the name of the Bowery’s Open Mic on Wednesdays. Each week there will be an array of music, comedy, spoken word and all things in between. Traditional Irish Music Session in Hedigan’s (The Brian Boru) in Phibsborough from 21:30 every Wednesday. If you play an instrument you are especially welcome (all levels are welcome). The Harleys are a popular coverband and they will be in the Mezz every Wednesday at midnight. For the month of April the GUM Collective, a group of Dublin-based visual artists, were artists-in-residence in the Gallery, investigating the life and work of Emil Nolde through their individual art practices. Their work, created in response to the exhibition, will be on view in the Millennium Wing Studio all day. Every Thursday a free tour of Grangegorman Military Cemetery on Blackhorse Avenue takes place. Meet inside the cemetery gates. Admission is free and everybody is welcome. Ring 01-6770095 for more information. Grangegorman Military Cemetery is in Blackhorse Avenue just outside Phoenix Park. It is the largest military cemetery in Ireland. It was first opened in 1876 to serve as a graveyard for the soldiers of what was then Marlborough Barracks, now McKee Barracks, and their families. Specific zones were laid out for English, Canadian, New Zealand, and Australian service men. The cemetery’s pedestrian gate is open from 10:00-16:00 seven days a week. Admission is free. Part of the Bealtaine Festival. Support the Dublin Event Guide – Buy your books here! This is a lunchtime song recital with sopranos Tara Lacken and Amy Conneely. They will perform a mix of oratorio, aria and song. The Temple Bar Craft Market during the week is back and it has moved to Thursdays in 2018. Organised by the Temple Bar Company the market will bring handcrafted jewellery, wood design, handmade soaps, original art, photography, fashion, specialised cards and stained-glass crafts. Come to this tour of the exhibition “Yeats: The Life and Works of William Butler Yeats”. The tour introduces William Butler Yeats (1865-1939) – one of the great poets of the twentieth century – and his many interests, including literature, folklore, theatre, politics, the occult, and Irish cultural identity. After the tour, you can listen to a selection of voices speaking some of his best loved poems, including Easter 1916. “Grandchildren, bring your grandparents! Come and take part in A Life of Play where everyone can create, anyone can dance, and all can play. Use your body, move to music, dress up and explore in a playground of the imagination – a place of mischievous, magical invention where fun feels right at home. You are invited to come to this Bealtaine Tea Party after a busy day enjoying the sights and sounds of Temple Bar. Enjoy a chat over tea while listening to live music. Or take part in our speaker’s corner where you’ll have the change to talk about a topic of your choice. Admission is free. To reach Crampton Court look for the entrance via Dame Stret by the side of the Olympia Theatre. This is a pop up talk about the work the GUM Collective have been making in response to the exhibition “Emil Nolde: Colour is Life”. Admission is free. Meet in the Millenium Wing Studio, Level 1. A weekly Jazz Club event with live band is taking place at J.W. Sweetman’s. Every Thursday the Little Museum of Dublin waives their admission charges for two guided tours thanks to sponsorship from Guinness. The first tour is at 18:00 and the second tour is at 19:00. Make sure that you are there at least 10 minutes before the start of the tour to get one of the limited places. The Little Museum of Dublin has a fascinating collection of artefacts from the last 100 years Dublin’s history. On other days and other times, admission is EUR 10 for adults and admission is by guided tour only. This is an information event for people living with psoriasis and their families in the #AskHowIFeel series of evnts. Dr Eddie Murphy, Clinical Psychologist and Nicola Ralph, Consultant Dermatologist; Caroline Irwin, Irish Skin Foundation Board Member and Psoriasis Patient Advocate; and Dr Clodagh Loftus, GP Clinical Expert in Psoriasis, to share practical techniques and advice for living with the condition. Admission is free, but registration is required via the website below. The tour “Baroque Art and Guercino” with Jessica Fahy will focus on baroque art in the collection, including the work of Guercino. Admission is free. Meeting point is the Merrion Square information desk. Following the event with Massimo Carlotto, the Italian Noir series continues in the Italian Institute of Culture with Carlo Lucarelli. Carlo Lucarelli is an Italian crime-writer, TV presenter and journalist. He was the presenter of a popular Italian crime television programme (Blu notte misteri d’Italia). He has written more than twenty novels and numerous short stories, including Almost Blue and Day after Day. Lucarelli also co-wrote the scripts of Detective De Luca, a crime fiction TV series released in 2008, which was adapted from his trilogy of novels set during Italy’s fascist era. The event in English and Italian. Admission is free, but booking is required via the website below. Twice every year, the Central Library together with the Local Enterprise Office in Dublin City are running a series of six free Business Lectures for everybody who wants to start or grow a business. The lectures will cover subjects such as the characteristics needed to run and fund your business. Digital marketing strategies and writing business plans will also be included. The next series will take place on Thursdays from 18:30-20:00 between 05 April and 10 May. An expatriate or expat is a person temporarily or permanently residing in a country other than that of their citizenship. And this is a weekly meeting for all Expats in Dublin (new and old!). If you are new to the city, this is an excellent way to meet people. Admission is free (no booking required! ), but you are asked to give the same kind of welcoming to new members as is given to you. The Shogunz of Stank with Mik Pyro and Pete Pamf among others will be in the Bowery every Thursday for a gig. They will play Funk, Hip Hop and Groove. A Table Quiz takes place in the Grand Social. On Thursdays teams of 4 people (or at least 2 people) will compete against each other over questions from the areas of General Knowledge, Music, Film, Sports & Entertainment. Every Thursday a Singer Songwriter Night will take place in Mother Reilly’s in Rathmines. This is YOUR chance to show everyone what you can do, alternatively you can just listen to the talented Singer/Songwriters. Admission is free. A Fun Pub Quiz takes place in Brady’s in Terenure on Thurs. The quiz will be on every Thursday night in the Lounge at Brady’s. Keith McLoughlin is the Quiz Master. The Bray Jazz Festival is happening from Thursday until Monday and the Long Beach Jazz Band will be in the Harbour Bar as part of the “Wicklow Wolf Jazz Trail”. A weekly Trad Music Night is taking place in McLoughlin’s in Dun Laoghaire. It is an acoustic night and all musicians are welcome. Admission is free. Every Thursday a free Trad Session takes place in McNeills and often there are high profile Trad musicians performing. The Woolshed Karaoke is happening every Thursday from 21:30. Anyone can participate! Admission is free. Dublin City Hall has a museum/exhibition in the basement, called “The Story of the Capital”, it is an exhibition about Dublin’s History and you should definitely check it out at some stage. At the “Hugh Lane First Friday Culture Club” on Friday, you will look at Sculpture in the Hugh Lane Gallery with Liliane Puthod. In collaboration with Dublin’s Culture Connects, the Hugh Lane Gallery’s First Friday Culture Club offers the opportunity for engaging with the Gallery’s education, collection, conservation and temporary exhibitions programmes in a fun and relaxed way. Each talk is followed by tea/coffee and further discussion. The film “Pathways: Irish Routes to the Art of the Matter” is a documentary about successful Irish creatives who are making it abroad. It uncovers the story of how they got there and looks at where and when the seeds for their success were sown. Filmed in London, Malmo, New York, Los Angeles, Belfast, Dublin and Kerry. The film is by radio presenter, photographer and film maker Donal Dineen and there will be a post screening interview with him. Admission is free. The event is part of the Bealtaine festival. Relatively Speaking is a guided tour through three art galleries. It will will begin at Project Arts Centre with Agnieszka Polska’s exhibition Softly Spoken. Then the walk will go to the Gallery of Photography for Kenneth O’Halloran’s Modern Ruins and other stories. And the tour will finish with Hannah Fitz’ solo exhibition at Temple Bar Gallery + Studios. Admission is free, but booking is required. The event this month is part of the Bealtaine festival. Spain is a very different country from that of just a few years ago. The economic crisis and the recovery, the political changes and Spain’s relationships with Europe and the rest of the world are all transforming our country, with new challenges and opportunities opening up. Josep Piqué, Jordi Casas and Paddy Woodworth will discuss the situation. The Contemporary Music Centre is inviting to a ‘pop up’ opera for the Bealtaine Festival, called “Bealtaine@Templebar”. The composers of the opera will work collaboratively with each other and with specialist performers to explore new approaches to the opera form. This Lunchtime Piano Concert with Peter Regan in the Shaw Room is part of a series of events that features the six Irish competitors who will take part in this year’s Dublin International Piano Competition. The Pop-up talk “Guercino and Denis Mahon” in Room 31 with Jessica Fahy will discuss the art historian Denis Mahon and the Italian artist Guercino. The Cemetery at Arbour Hill is the last resting place of 14 of the leaders of the 1916 Rising. Among those buried there are Pádraig Pearse, James Connolly and Thomas Clarke. This tour every Friday introduce the Cemetery and will also explain the background and the event of the Easter Rising. Admission is free and no booking necessary. The meeting point is inside the cemetery gates. “Collaboration and Film” is a workshop with filmmaker Eoin Heaney. As well as hearing about Eoin’s work and some of the practice and theory behind collaboration and film, Eoin will be showing some as yet unseen work. This is an opportunity to get ‘behind the scenes’ and meet a filmmaker whose work celebrates the poetry of cinema while reflecting more civic minded topics. Admission is free, but booking is required. Check the website below for details. “Out Thinkers” showcases the talent of LGBT+ researchers, providing a platform where people can talk about their scientific work while truly being themselves. This Out Thinkers event will feature a range of phenomenal speakers talking about their research and experiences as LGBT+ individuals in academia. Find more information and register for this free event via the website below. The Bray Jazz Festival will run from Thursday until Monday this weekend with the main days of Friday, Saturday and Sunday. There are plenty of non-free events taking place, but in addition to that the “Wicklow Wolf Jazz Trail” is a series of free Jazz events in pubs and restaurants in Bray. Apolgies for the odd way of putting this list together with location at the front and the perfomer at the back, but that’s how the Jazz Trail website shows it and I didn’t fancy re-organising everything. Cornucopia Café & Restaurant host live music three evenings a week (Thurs, Fri and Sat). The restaurant is a Wholefood & Vegetarian Restaurant and is open until 22:15. + Every second Thursday N.C Lawlor, a songwriter, session player and troubadour plays a mix of country, bluegrass & blues from 19:30-21:30. + Every Friday (19:30-21:30) Junshi Murakami plays Irish Harp. + Every Saturday (19:30-21:30) Nollaig Mann plays a collection of popular and jazz classics. Homebrew & the Bad Examples are an Outlaw Country bands, playing everything from Hank Williams and George Jones and Faron Young to Waylon Jennings and Johnny Cash, Western swing to psychobilly. They will be supported by Bróna Keogh and her band. Brona writes songs about personal experience and observation and her sound reminds of 60s era singer Joni Mitchell. Gavin Povey and The Fabulous Oke She Moke She Pops” will play New Orleans style Piano Rhythm & Blues, Boogie Woogie and Rock’n’ Roll. Gavin Povey has played piano with Van Morrison, Finbar Wright, Kirsty MacColl, Steve Cropper, Shakin’ Stevens and many more. McGowans in Phibsborough run a monthly Singles Night. There will be music, games and ice breakers. Admission is free, but booking is required via the Eventbrite link below. The Hillbilly Casino are playing American blues with hardwood Honky Tonk, Rock N’ Roll, Rockabilly and some DIY Punk Rock at this gig. The walks in April will happen on 08+14+15+21+28+29 April. All walks are free, but pre-registration is required (details are on the website). Please note: This section contains observations taken from the world I live in that strike me as odd. I express my personal opinion and you might not share it. ;-) If you are easily offended by opinions that are not identical with your own, please don’t read this section and I am VERY serious about that! Google’s interpretation of “internship” is the “position of a student or trainee who works in an organization, sometimes without pay, in order to gain work experience or satisfy requirements for a qualification.” The part that is missing in this definition is that the internship is only for a limited period of time. But this is not the only problem with that definition. The other problem is “sometimes without pay”. Many arts organisations in Dublin regularly look for interns and some say that they couldn’t operate without them. Internships are usually restricted to 6 months and are very very often unpaid. BUT, this is not ok! This week the RTE News website reported that the Irish Rugby Football Union (IRFU) was forced to withdraw a job advertisement for a full-time six month long unpaid internship in the area of sports science that required the candidate to have a PhD or a Masters degree. The IRFU claimed that the job ad was publicised “in error” and without approval, seemingly when it was pointed out to them that unpaid internships are essentially illegal. And this is the shocker that arts organisations in Ireland are clearly unaware of: The Workplace Relations Commission has stated that ALL employees with a contract of employment, even if they are called “intern” are entitled to salary of a minimum of EUR 9.55 per hour. That is EUR 382 for a 40 hour week and is a minimum of EUR 1528 per month. The National Minimum Wage act does NOT contain an exemption for internships. All dodgy!! And the names of the companies and organisations that break the law? Keelings, Decathlon, Dualway, Connect The Dots, YouBloom, Christ Church Cathedral. This list was the result of a quick Google search and a more detailed search would probably bring a MUCH longer list of companies and organisations that want to employ but not pay. It is highly likely that plenty more unpaid internships are among this list of vacancies on all websites, especially because many companies don’t say if the internship is paid or unpaid. Sneaky! The rules seem clear, but do the rules make sense? Yes and no! And it is a similar problem as with Au Pairs in Ireland where the Workplace Relations Commission has said that Au Pairs have to be paid at least the minimum wage. There are circumstances where an Intern (or an Au Pair) can learn a HUGE amount and will get therefore an adequate compensation through the learning that they couldn’t get otherwise. In that case there should be an option maybe to pay a lower amount than the minimum salary. But I know also cases where internship is or has been totally abused to get a free worker in the same way as the IRFU was nearly doing it. Our government should spend time on fixing the Au Pair and the Internship rules. The way they are now is not helpful to anybody! You are receiving this newsletter because you have subscribed to it!! If you don’t want to receive this mail anymore, just click on the link at the bottom of this mail. It would help me if you told me in an e-mail why you decided to unsubscribe, but that is not a “Must”. If you only want to stop receiving the newsletter temporarily, you can – if you wish – discuss this with me by e-mail so that we find a solution that makes sense to you. If you unsubscribe using the link at the bottom of the mail and there is a chance that you – at some stage – want to re-subscribe, please make sure that you keep a mail with the “unsubscribe link” because I will not be able to add you anymore to the list once you have unsubscribed using this link. The only way you can re-subscribe is to follow that specific link and change the settings yourself. This Event Guide (the “Dublin Event Guide (for Free Events)”) is an Event Guide with a difference. It covers mostly free events based on the thinking that free events deserve additional support and that non-free events have the money to pay for advertisement. The Guide is a _Guide_ and not just a listing and is therefore at times quite extensive. It is sent for free to anybody who is interested and if you want to be added to the mailing list or know somebody who would like to receive this guide, just send them to www.dublineventguide.com, where they can subscribe. If you have feedback – good or bad – PLEASE tell me via dublineventguide@gmail.com. BTW: I am not paid or otherwise rewarded for compiling and distributing this Event Guide it is purely a hobby so your donations are needed: www.perfectresults.info/donation.htm . Advertisement in or sponsorship of the Dublin Event Guide (for Free Events) is possible and very welcome, please contact me for more information. Please note: The Dublin Event Guide (for Free Event) is not related or connected to the long gone fortnightly printed publication “the event guide” that you found until December 2008 in pubs and other venues. Copyright 2018 by Joerg Steegmueller.